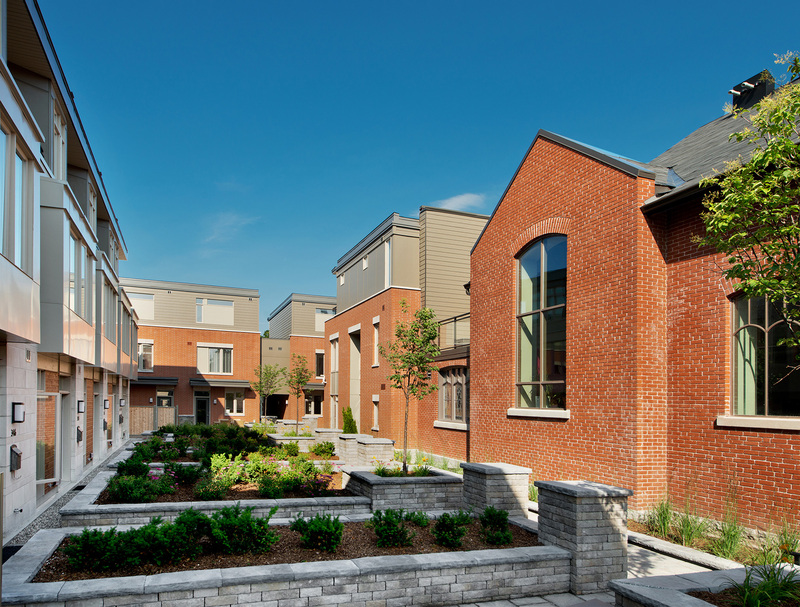 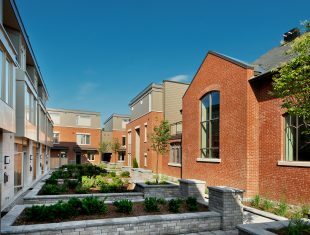 Ravenhill Common is a 19-unit residential infill project on the site of Westboro United Church, built in 1913. 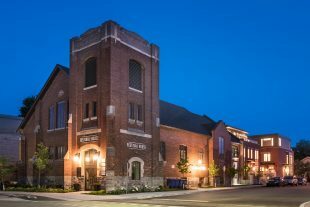 While not identified for heritage value, the main church building was seen as an asset to the development, and its preservation was essential to maintaining a community connection despite the transformation of the site. The redevelopment included an extensive renovation of the church to accommodate what is now known as “Festival House,” the headquarters of Bluesfest, a small performance space and the Bluesfest School of Music & Art (operated in conjunction with the Dovercourt Community Centre). 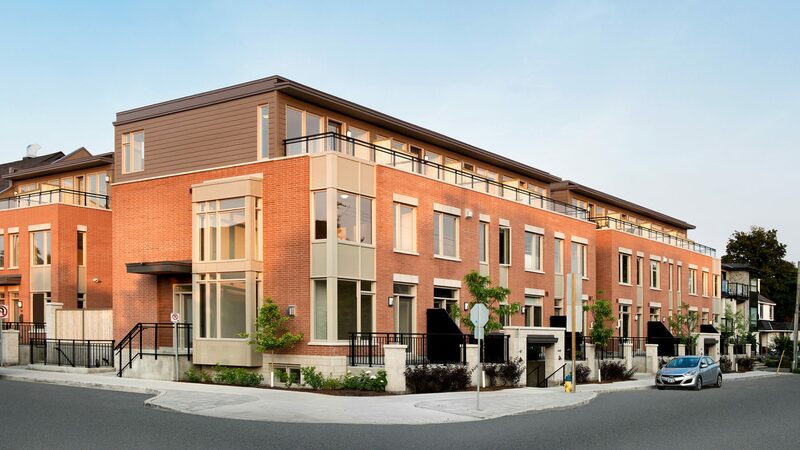 The Churchill Avenue streetscape in the area of Richmond Road is characterized by a dense low-rise urban expression. 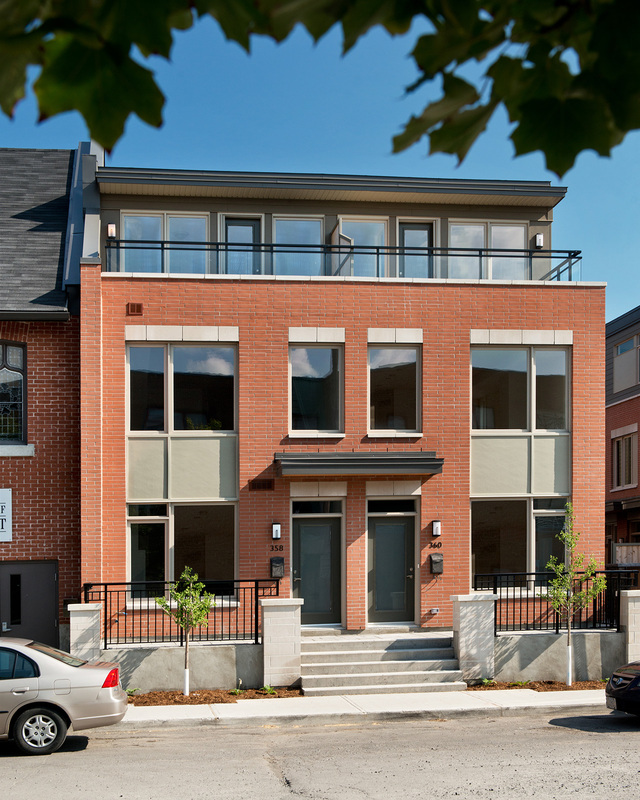 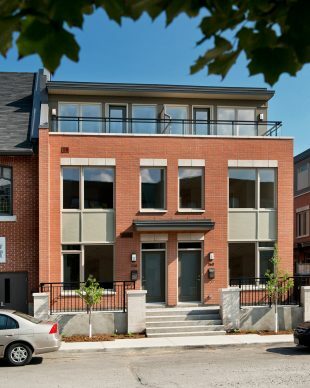 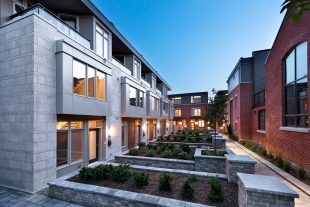 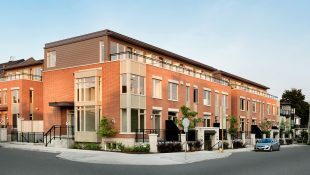 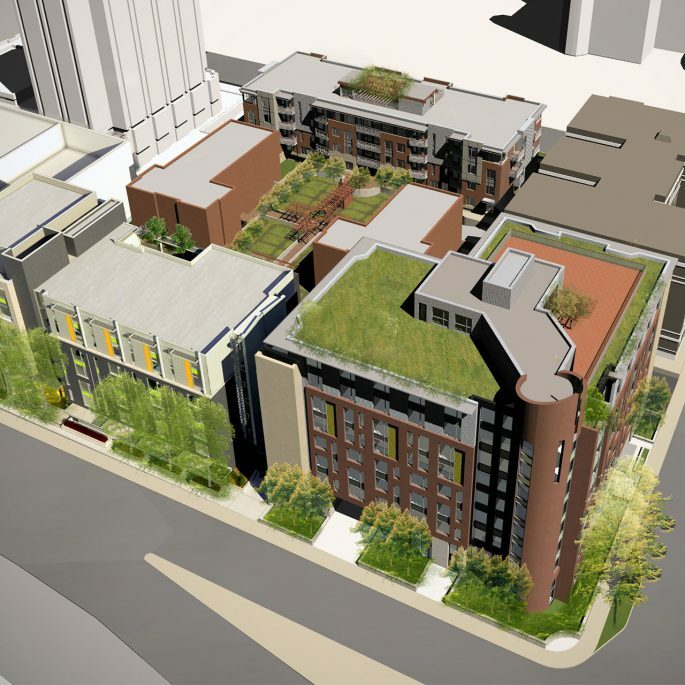 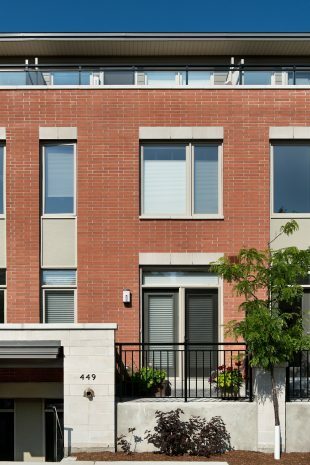 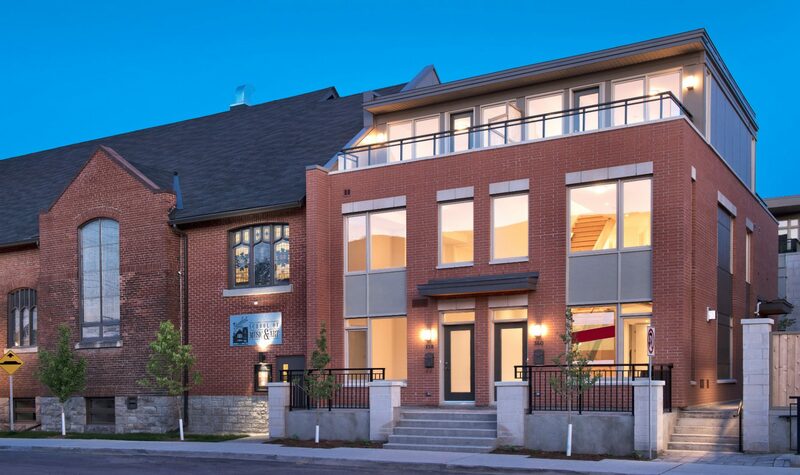 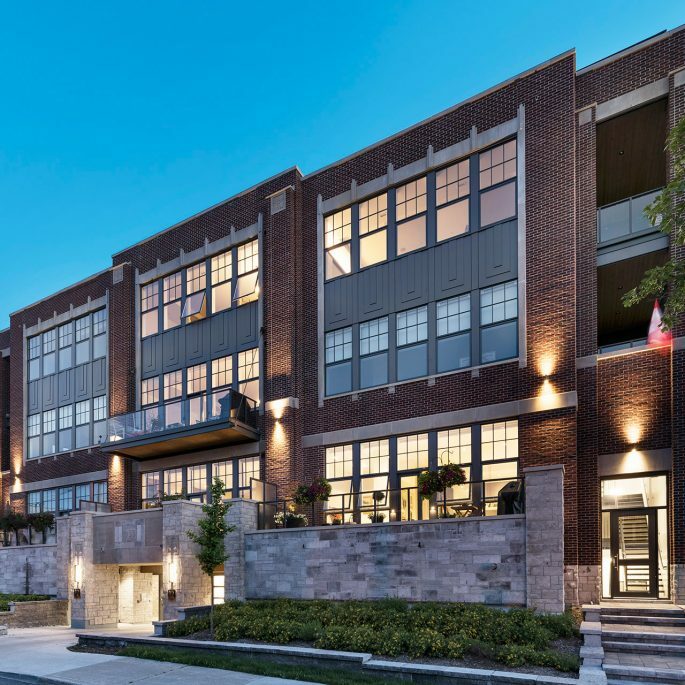 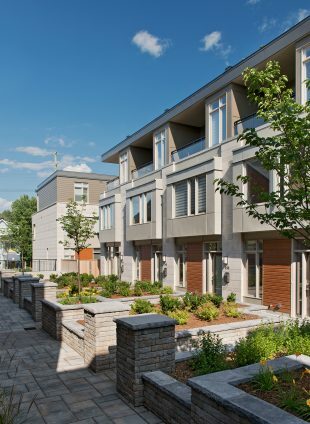 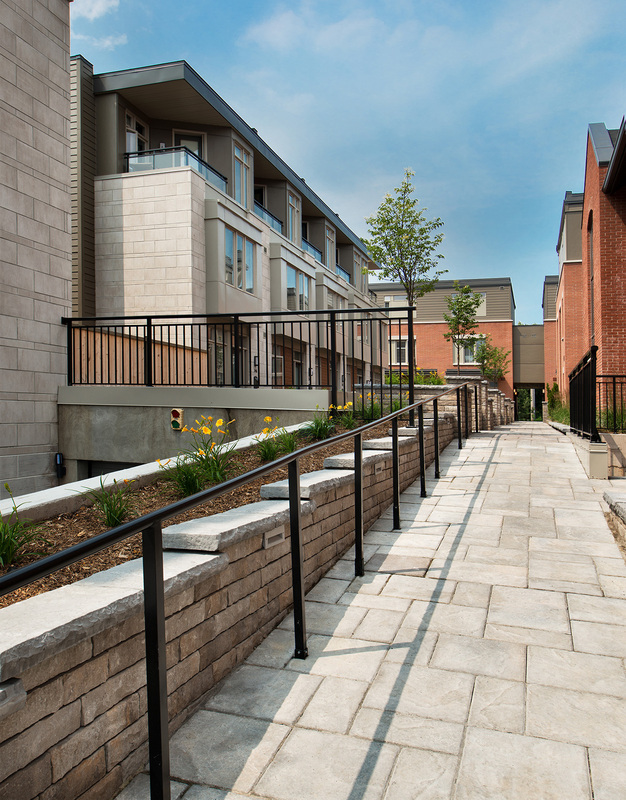 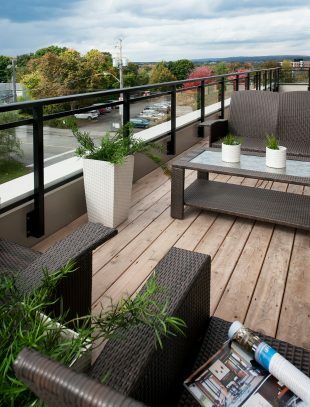 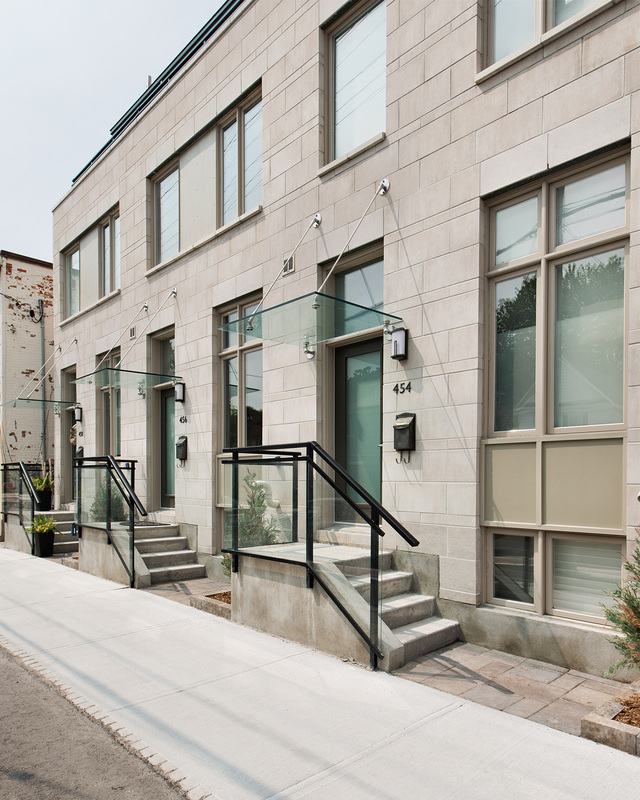 The block of three townhomes fronting Churchill is designed accordingly, with stoops in place of front terraces, and a contemporary palette of smooth masonry and glass entrance canopies. 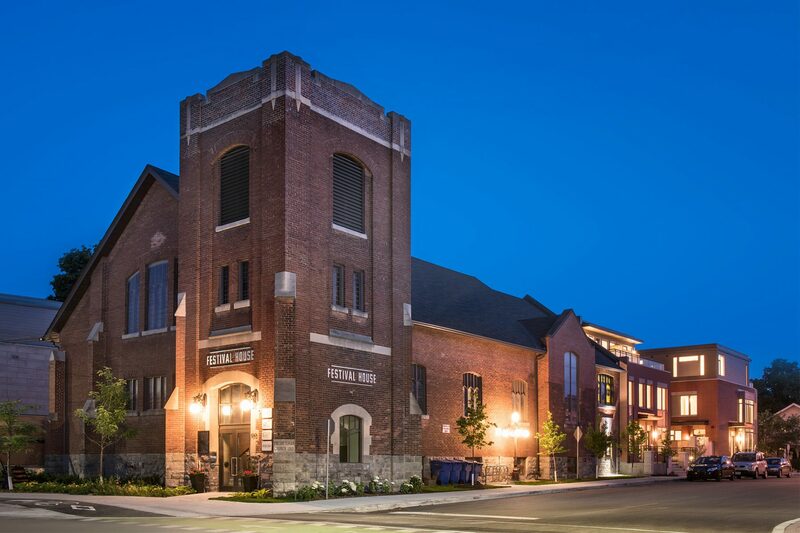 The north exposure of the site is dominated by the original church building which has been re-purposed for commercial/community use. 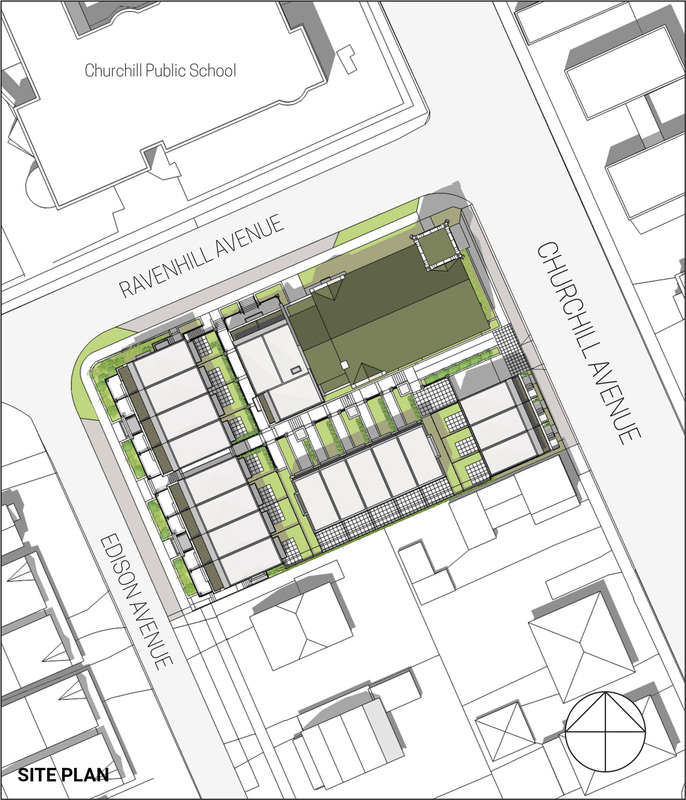 Two townhomes front onto Ravenhill in a small block attached to the church, delineated by a shallow brick wing wall which establishes a buffer between the public and private domain. Each of the brownstone blocks fronting Ravenhill and Edison derive their massing and materiality from the Ravenhill facade of the church. The masonry plinth and pillars at the base of these units mimics the rusticated stone base of the church. Third storeys are set back and receive a lighter material treatment, giving the blocks a two-storey feel from street level roughly in line with the eave height of the church. 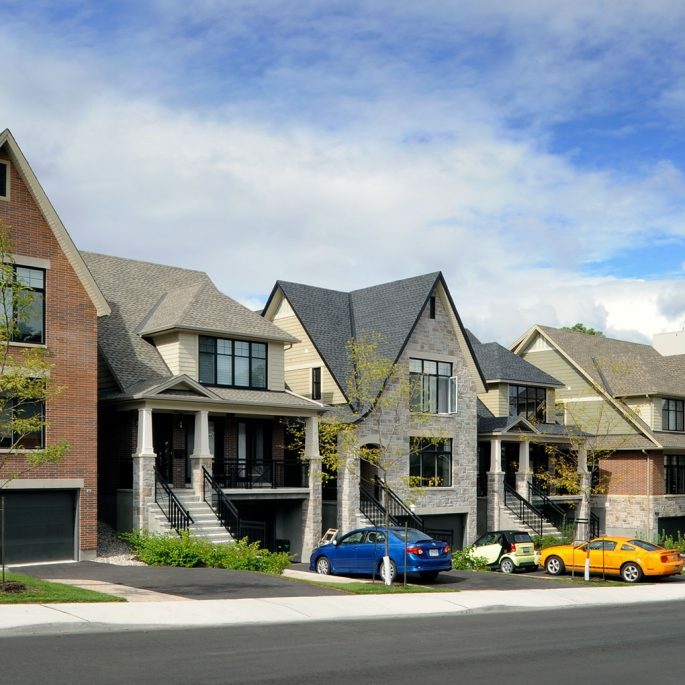 Edison Avenue is dominated by two-storey single family homes typical of the Westboro neighbourhood, while newer infill projects of higher density and up to three storeys have emerged over the past decade. Front porches and downplayed garages (sometimes nonexistent) are noted as predominant features of the older homes. 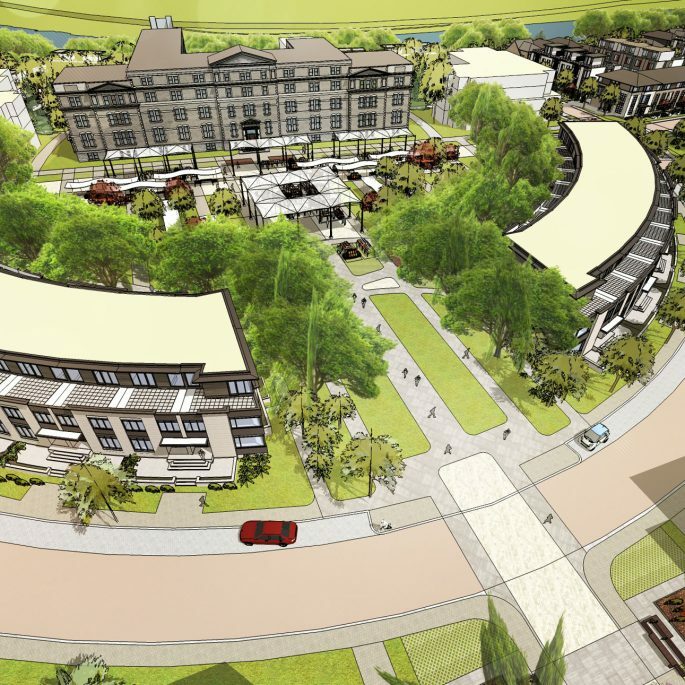 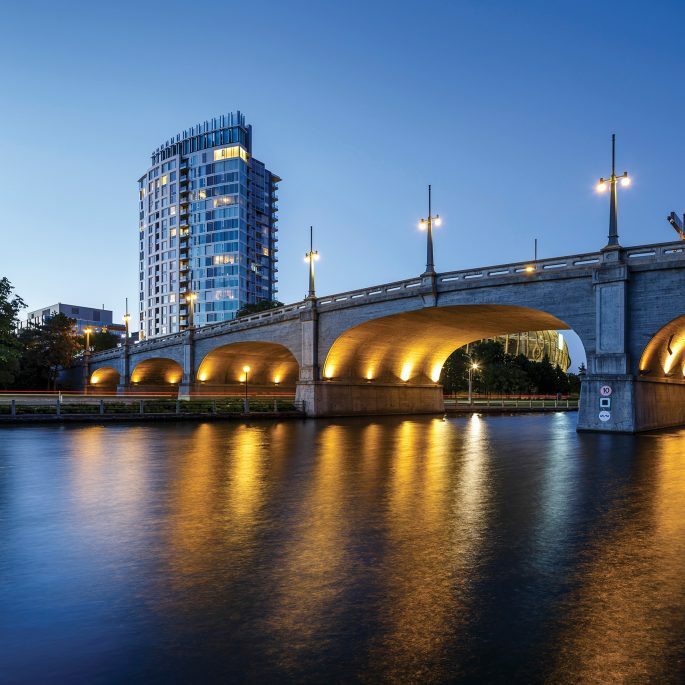 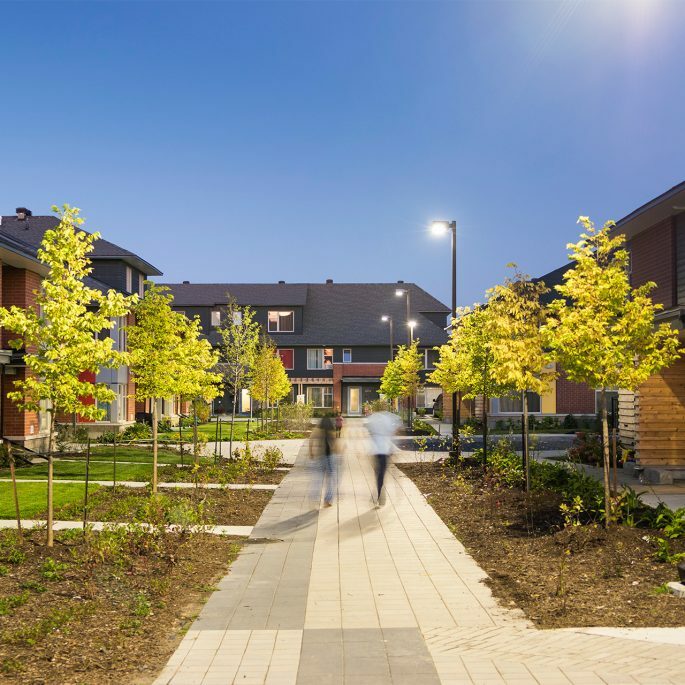 This informed the design of the Edison townhomes, which feature raised front terraces and entrance pavilions that recall the porches that line the street to the south. 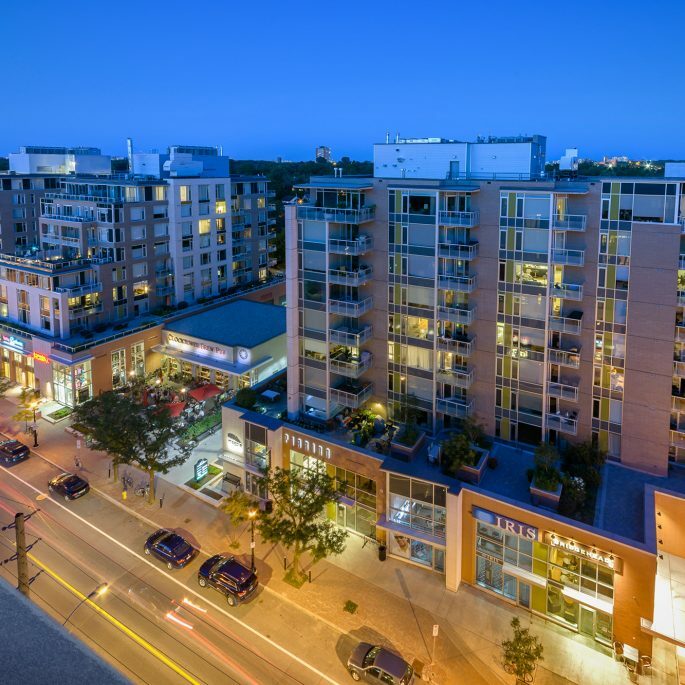 The presence of the car is downplayed by the Churchill-accessed parking garage. 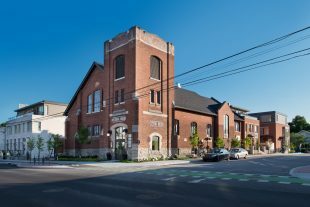 The former church strongly addressed Churchill, with three major entrances facing east. 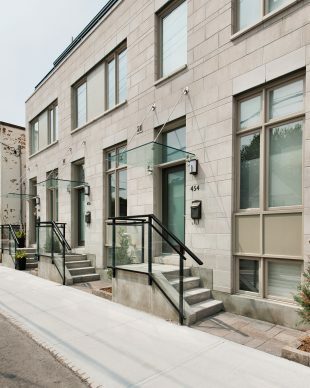 This frontage was regarded as the dominant entrypoint to the site, in both a vehicular and pedestrian sense. 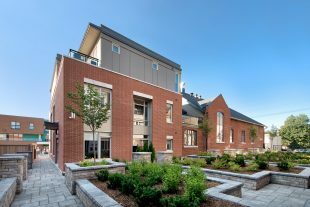 Thus, the garage entrance is located here, tucked away beside a landscaped walkway into the courtyard (or “common”).